← Is Tammy Pressing Her Luck with Peyton? ESPN has a NFL commercial that says “it all comes down to Monday night” and that was never more true than in our house last night. Tammy’s shirt for Manning Monday. That’s because Tammy’s favorite football player, Peyton Manning, was playing on Monday Night Football. She came home from work all excited about the game and quickly put on her lucky Peyton Manning shirt. We turned on ESPN and started watching the hour-long pre-game show. Every time Peyton came on TV Tammy stopped whatever she was doing to watch and listen. She sat on the couch, wrapped in a blanket and looked at the TV as intently as a kid watching Saturday morning cartoons. After listening to him talk football with Jon Gruden, Tammy took to the Twitter with the following. 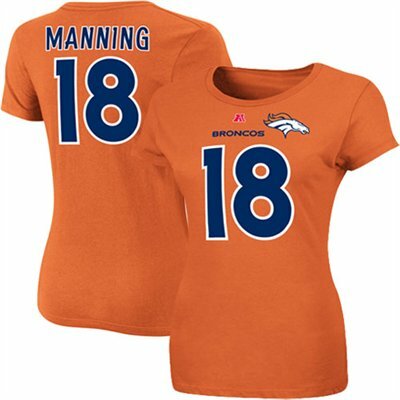 @TWo1855: Nothing makes me smile more than watching #ESPN talk #PeytonManning all night. Looking back, I wish had taken a picture of how cute she looked because it was prolly the happiest moment of the night for her. We headed down to watch the game in the basement because she was recording two shows on “her” DVR. She settled into her rocker recliner and the game got started. Manning and the Broncos got the ball first and it only took three plays for Tammy to break out the obscenities as Peyton threw an interception. Thank YOU for sticking with me Tammy. She stayed upset for all of two seconds before turning cheerleader and trying to motivate her team. Tammy: (clapping her hands) That’s alright guys. That’s OK.
She kept her spirits high and joked on Facebook with some of our friends about how Eli, Peyton’s brother, threw three interceptions on Sunday but still finished with over 500 yards passing. The Broncos next possession brought new hope for Tammy but it was crushed on Denver’s third play as Peyton threw his second interception. Tammy’s anger bubbled to the surface before she again turned on the motivator switch. Tammy: F^ck me. (a few seconds later) Shake it off guys, it’s OK.
My friend, Daniel, and I continued to tease her on Facebook. Me: Looks like he may be trying to one-up his brother tonight. If he keeps this up he’ll do it by the end of the 1ST quarter. Her spirits were still high as Peyton led the Broncos on the field for their third possession when once again one of his passes was caught by an Atlanta defender. I’ll let my Facebook status tell you what was going on in our house. Me: He’s once… twice… three times a Manning… The 3rd INT drew the loudest swearing of the night. Tammy again took to the Twitter to try to mask her feelings. Jake couldn’t believe what he was seeing and took to the Twitter as well. 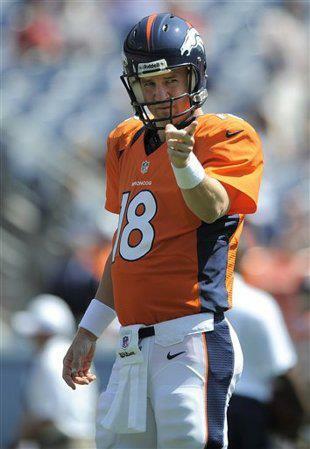 @Cooper236: 3 interceptions by peyton manning and it’s half way through the first quarter. My mom looks like she’s ready to cry. The Broncos weren’t done stomping on Tammy’s heart as the Falcons forced a fumble. That’s when the first signs of her cracking became visible. Tammy: (after the fumble) At least it wasn’t Peyton. It was around this time that I sent out a Tweet about how much swearing was going on in my house. @JWo1855: If I had a dollar for every time Tammy dropped an F-bomb during the game we could go to #Cabo. We eventually moved back upstairs to watch the game and toward the end of the night Jake came out of his bedroom with a question for Tammy. Jake: Hey Mom, who do you like more, Tom Brady or Michael Vick? Tammy: I don’t like either of them. Jake: Come on, you have to pick one. Tammy: (mumbling under her breath) Brady. Jake: (laughing) Ooooohhhh…. You love Tom Brady. I was so proud of him at that moment. On Sunday Tammy was debating whether or not to start Denver’s Eric Decker or Indianapolis’ Reggie Wayne. She went with Decker because of her love for Peyton. When Wayne scored a TD during his game on Sunday she was NOT happy. Wayne finished with 13.10 fantasy football points and Decker wasn’t performing so when he was back to return a punt Tammy got excited but once again was crushed. Tammy: Oooooh Gawd. Go!! Crap, that’s not good. Decker finished with 5.90 points. Around the six-minute mark Tammy was wrapped in a blanket and moaning like she had the flu before each snap. Below is a list of comments made by Tammy during the last 5-6 minutes of the game. Tammy: Of f^ck no!! What are you doing?!?! Awww geez!! Tammy: Sh!t you didn’t get the first down. Tammy: (moaning) Oooooh, what the fudge (she actually said fudge this time). Tammy: Oh Jesus!! (because it was running play)… Oh OK, it’s a touchdown, but it didn’t help me (because she has Manning on her two fantasy teams). I’ll take it though. Before Denver had even kicked off Tammy turned back into a Worry Wort. Tammy: Now this isn’t gonna mean nothing if the defense can’t stop them. This is becoming too stressful of a job for me. Before we went to bed I asked if she was going to be OK.
Me: Are you gonna call in sick tomorrow? Tammy: I don’t know… I might need to. She went to work but she did wear black as she was Mourning her Manning. Gallery | This entry was posted in Daily Life and tagged daily life, ESPN, Football, humor, Peyton Manning, postaweek2012, sports, Tammy. Bookmark the permalink. Very funny! I love your title, too!